Paragon might not have launched properly yet, but its hero roster is already growing. Iggy & Scorch are a the latest addition – a playable pair that will bolster the MOBA’s roster on April 21. See what else is releasing soon in our list of upcoming PC games. 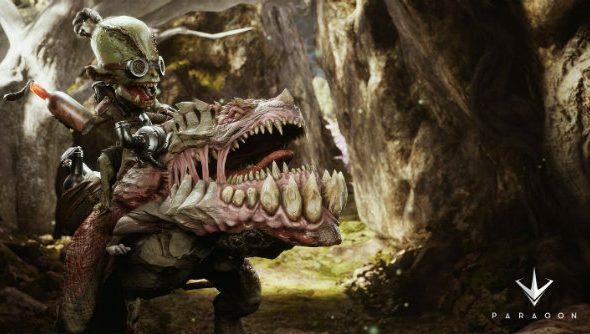 Iggy & Scorch are a symbiotic duo, with Iggy using Scorch as a mount. While on this perch, Iggy can lay down flame turrets to zone enemies, setting them up for serious damage. Sat stop Scorch, Iggy can also throw molotovs to cause fire damage over an area – an effect that can be compounded by Scorch, who can secrete a flammable oil to expand the radius and increase the damage output of the fire. Considering it’s in Early Access, the pace of these updates is pretty impressive. It was only recently Epic added a new tank hero called Sevarog. You can sign up for Paragon’s paid Early Access, which is live now, on the official site. A free open beta is also coming in summer 2016.